Another Friday! Why is it that Fridays are always anticipated? Doesn't matter what it is that keeps us busy all week, Fridays always seems to have a special allure. And since it is Friday that means it's time for five minutes of writing, thanks to Lisa-Jo. Here are her rules. Find five minutes and join in the fun! 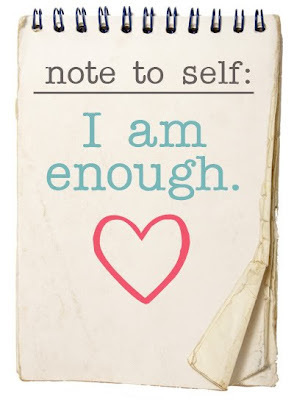 I was taught that phrase as a kid - "I am enough." Meaning I don't have to be someone else's enough. What I do, as long as I am doing it to the best of abilities, is enough. It's perfectly enough. And sometimes it worked. I felt happy because I did my best. Then came those wonderful days of standardized tests - ACT, GRE, LSAT - and it was filled with I am not enough. The scores were not what everyone else had. The schools didn't see me as enough. I was crushed. Sure I had been told I don't test well, I need a different method - it was on paper that I was different. Yet with those standards, enough didn't fit with me. How many times do we find that the standards of the world do not allow us to be enough? Too often to count I think. How often are kids crushed because someone in the world says they are not enough? How often to teenagers feel the over-inflated ego that comes with being told they are better because they fit these standards perfectly while the teenager next to them barely makes the cut? How often do moms feel discouraged when their kid doesn't fit into the percentile of most kids? This list can go on and on. Why do we feel we need to have these standards? Why can't our best just be enough? Why can't we ask for help with the areas where our best isn't as good as someone else's without feeling like we failed? When will we really feel like we are enough just as we are? Because it is in those moments, when we feel we are enough that we are excelling at our full potential and somehow those moments of enough become more. Even more importantly, how to do we teach and model this for the next generation? If only the answers were as easy to come by as the questions are to ask. Powerful and honest thoughts and questions. The gift was that you believed you initially were enough (from a loving home, start) and then the conflict assaulted you from within and without due to these imposed "standards " . Sad that this is the common case. Very nicely done for 5 minutes, Lady! So thankful you had others in your life tell you that you were enough. We took our son out of high school as a Sophmore as he was flunking out of school. We began homeschool (with a tutor as I work full time) and he will graduate just one semester behind with mostly A's and B's. Simply because we believed He was enough. That he wasn't stupid and that His best was enough. So much power in those words.